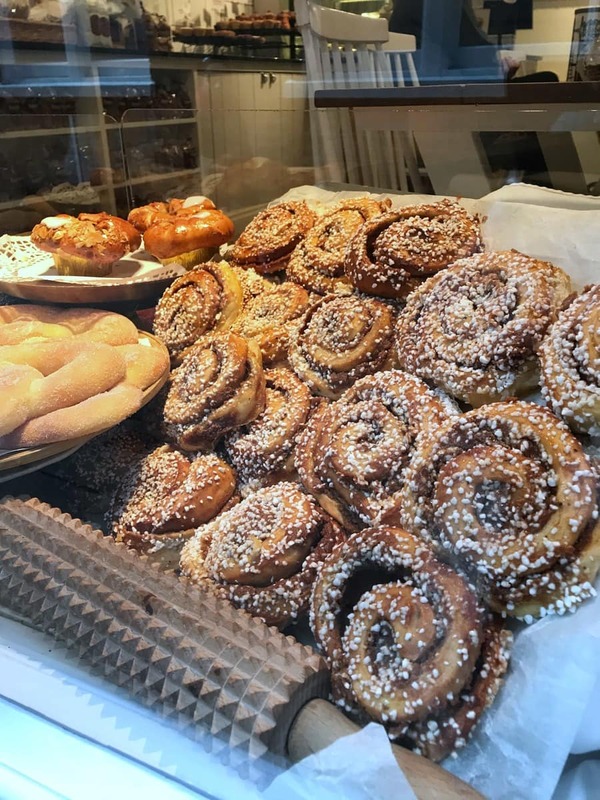 Cinnamon buns (or Kanelbullar) are the sugary Scandinavian treat traditionally served at Fika. Fika is a part of Swedish culture that translates into ‘taking a break’ and I use the word culture on purpose because it really is a way of life. 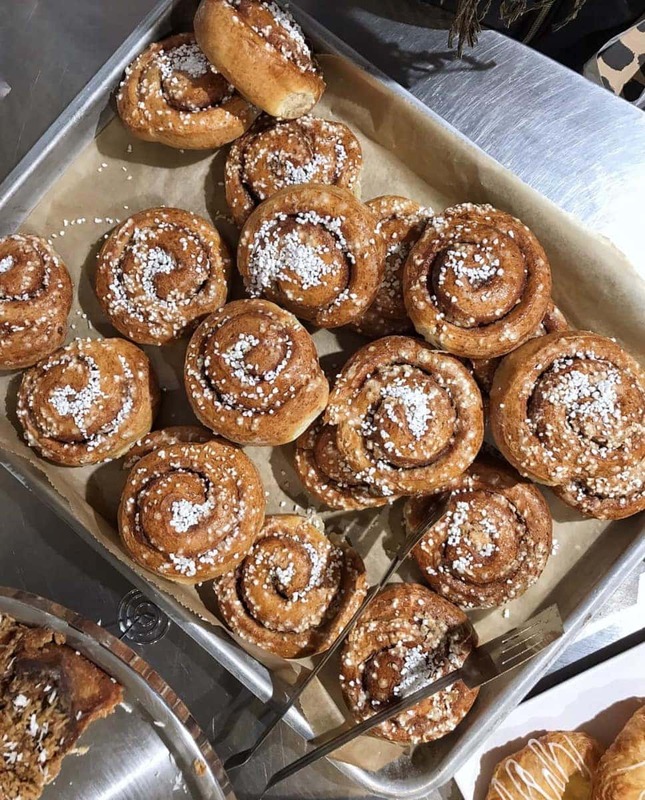 London has adopted cinnamon buns with open arms and even though October 4th is National Cinnamon Bun Day we don’t need a special day to enjoy them, do we! 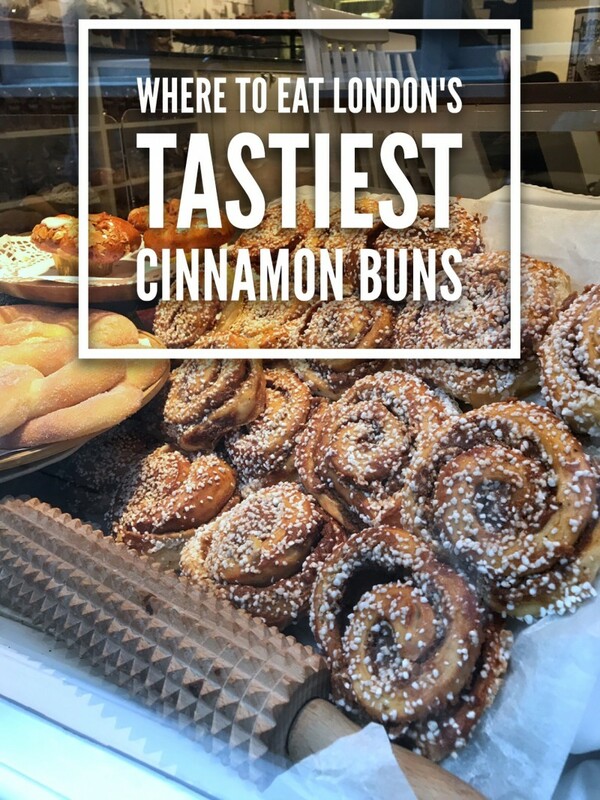 As with all my bucket lists, I’ve tried and tested every single one and in no particular order here’s a list of the tastiest cinnamon buns in London. 1. Ole & Steen, Various Locations. … For those who want their mind blown. I’m not usually biased on these bucket lists but the cinnamon ‘social’ from Ole and Steen has to be the best one I’ve ever eaten. So much so it was featured on my must eat list of 2018. It comes as a slice rather than a traditional bun and instead of just the usual layers of just cinnamon sugar this one comes with dots of sweet custard throughout and strips of icing on the top. 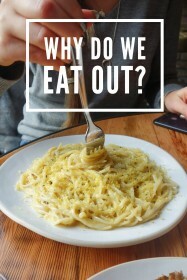 Their cinnamon social comes as either a single portion or you can buy it as a giant sharing version (hence the name ‘social’) that could easily feed 6 people. Most of the stores are open until 10 pm so it’s perfect for a late night sugar craving. 2. Nyborgs Kitchen @ Broadway Market, Hackney. … For those non traditionalists. 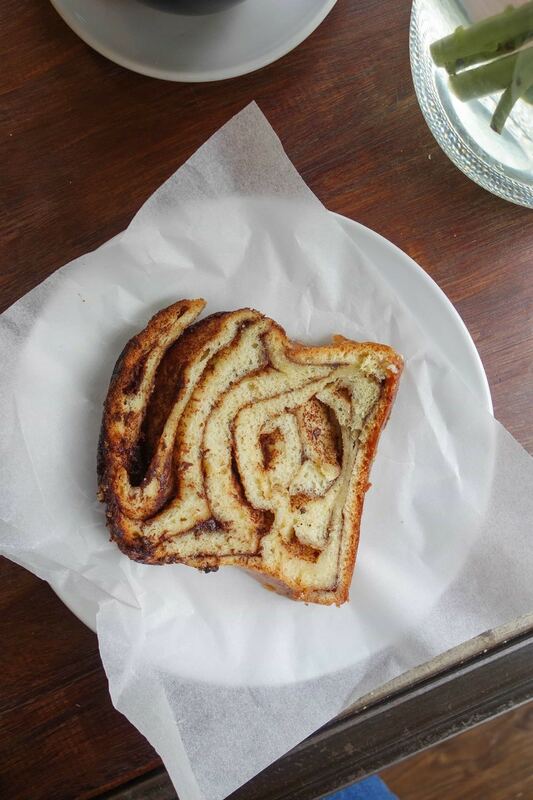 Nyborg in Broadway Market has taken the simple cinnamon bun and turned it into a cinnamon bun bread pudding. Absolute genius! This Nordic twist on a British classic is cut into a big wedge and loaded with Scandinavian Skyr yoghurt and blueberry compote. It has layers and layers of stodgy, comforting bread and the sweet spice of cinnamon lingers throughout. 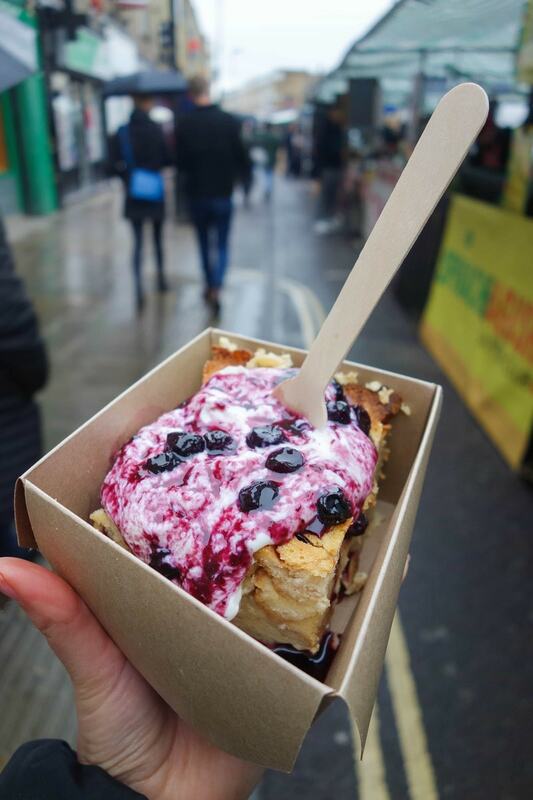 A super decadent brekkie or an after lunch dessert from one of the many stalls at the market. 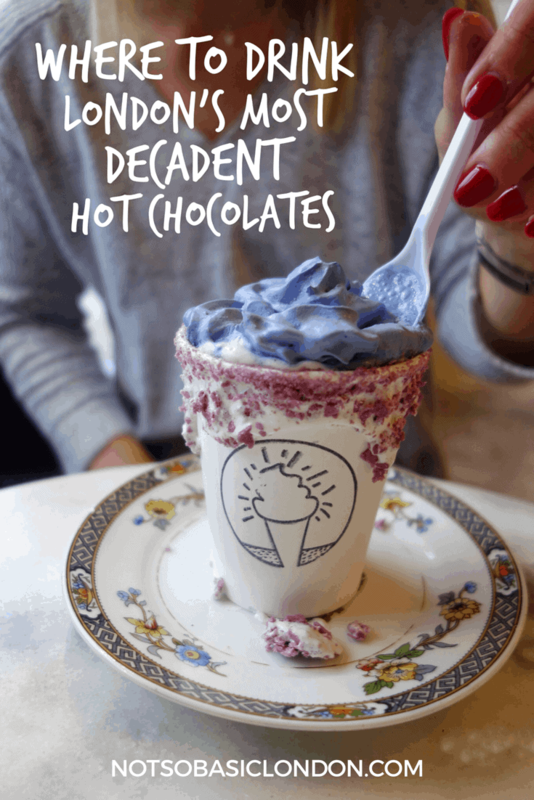 … For those who love cute coffee shops. 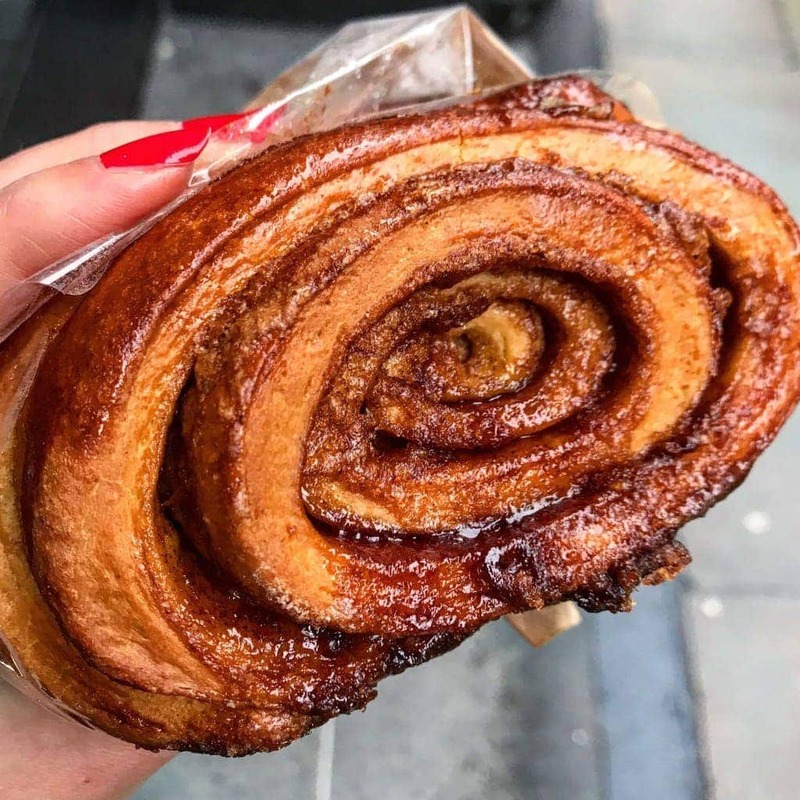 The sign of a good cinnamon bun is when you can smell it before you can even see it – that’s true for the tiny Swedish bakery Bageriet just off Covent Garden. Hidden down a small, unsuspecting alleyway, this tiny little bakery produces authentic Swedish baked goods by authentic Swedish bakers. Their version is the true way of dressing a bun; round in shape and with crunchy pearl sugar on the top. Best served inside with a cosy book and coffee. If you’re lucky you might see them popping in and out in their cartoon-like chef hats. 4. Fabrique Bakery, Various Locations. Fabrique cinnamon buns are one of the most photographed in London. 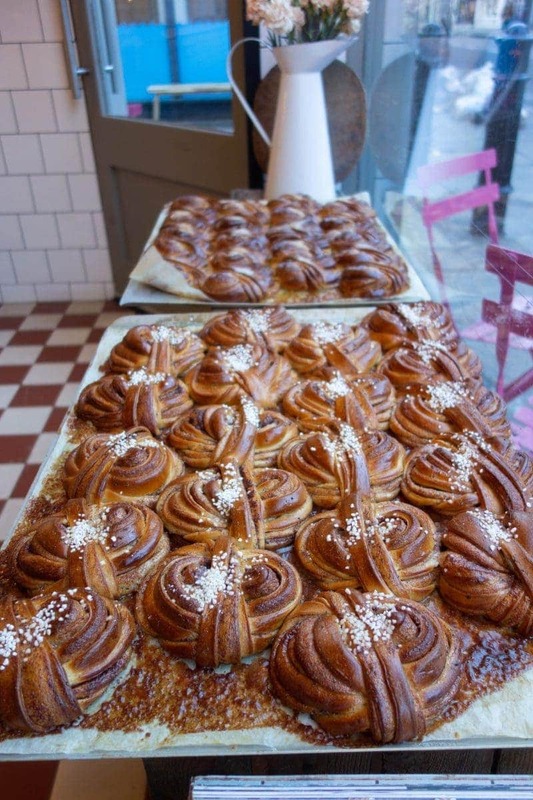 The bakery has 4 locations here in the capital, but they originated from Stockholm. The texture of this bun is the dense and chewy kind with bits of crunchy sugar nibs on top. Inside their bakeries, they are going for the whole rustic, Scandi, minimalist look which will make any interior lovers giddy with joy. Your Instagram will thank you for this one. 5. Mughead Coffee, New Cross. So many people told me about Mughead Coffee’s cinnamon rolls that I just had to go and try them first hand to see what the fuss was about. News flash, the hype is real. 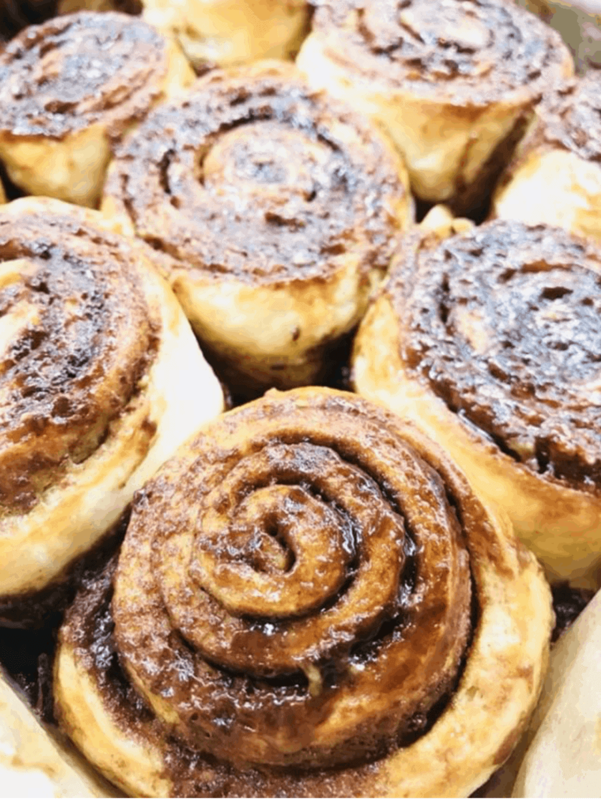 Their buns are baked fresh in house every morning and massaged in are gooey, sticky cream cheese frosting until they are soaked right through. An unassuming little cafe with some almighty buns. Thanks to those who people who recommended it to me and brought it into my life!!!! 6. Margot Bakery, East Finchley. … For the cafe hunters. It’s neighbourhood gems like Margot Bakery that knock big mass-produced chains out of the water. It’s a small, local café but their range of baked goods is vast. The counter is full of freshly baked bread, buns and babkas, all made in the morning and throughout the day so they’re super fresh. 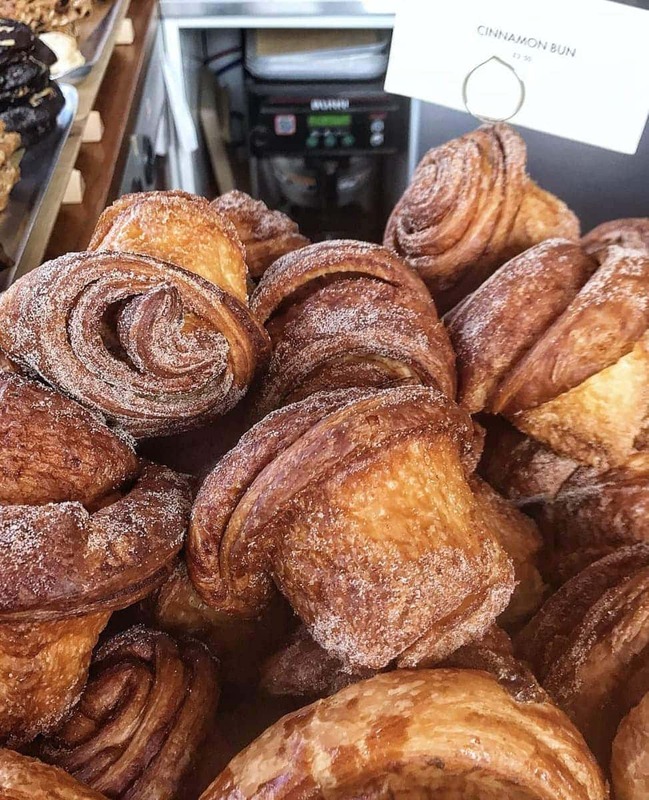 They do two types of cinnamon treats in the form of a bun and a babka. Both are great but the babka topped it for me. It’s cut in front of you to a generous size and has a sweet, soft, bread-like inside with a caramelised, crunchy shell. The outside will be the bits you’ll want to save until last just like those crunchy corners of a lasagne! 7. Nordic Bakery, Various Locations. 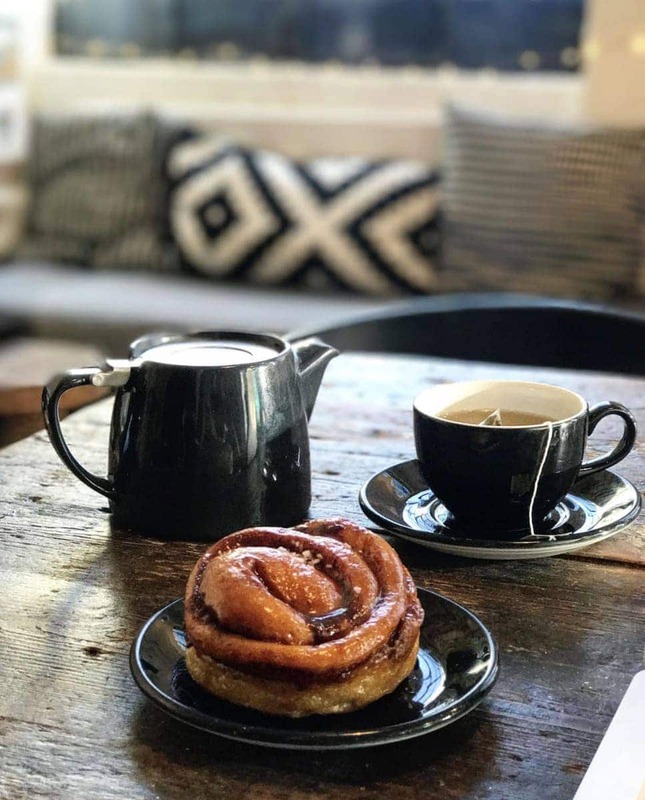 Nordic Bakery is a minimalist Scandinavian café doing Nordic inspired sweet and savoury bites but they are best known for their golden glazed Finish cinnamon rolls. They are a denser, chewier bun when cold but squidgy and soft when warm. If you can snag one straight out the oven you’re winning at life or pop it in the microwave at home. A nice place to stop for an open rye bread sandwich, a coffee and a cinnamon bun for lunch. … For the coffee lovers. 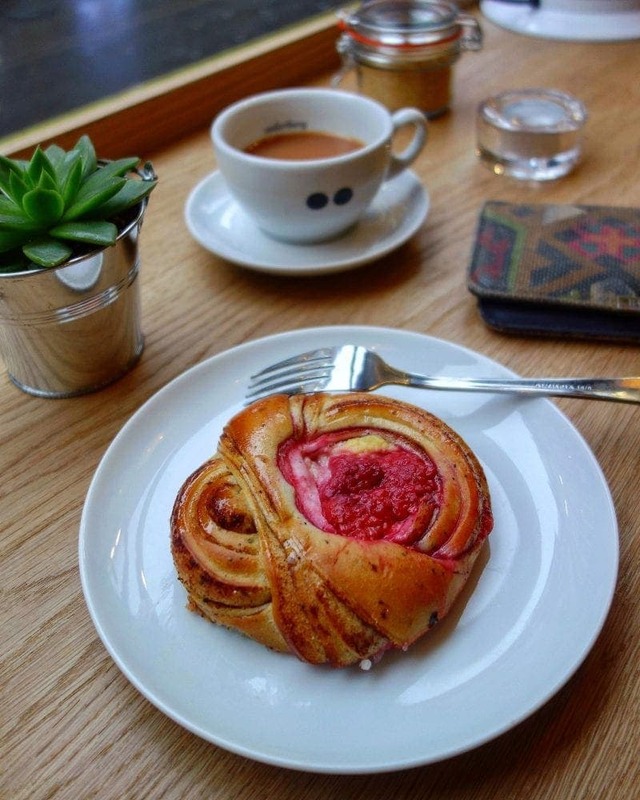 Tucked away in a cosy corner of Bermondsey Square is Swedish coffee shop Hej which literally translates into Hello! The cinnamon buns are sat proudly on the counter as you walk in and are tall, plump and fluffy with a thick glaze of cinnamon over the top. The café has a large communal table in the middle and if you can catch it very earlier morning there’s a little bit of that quiet ‘hygge’ feel going on. … For the ones who want to go high-end. 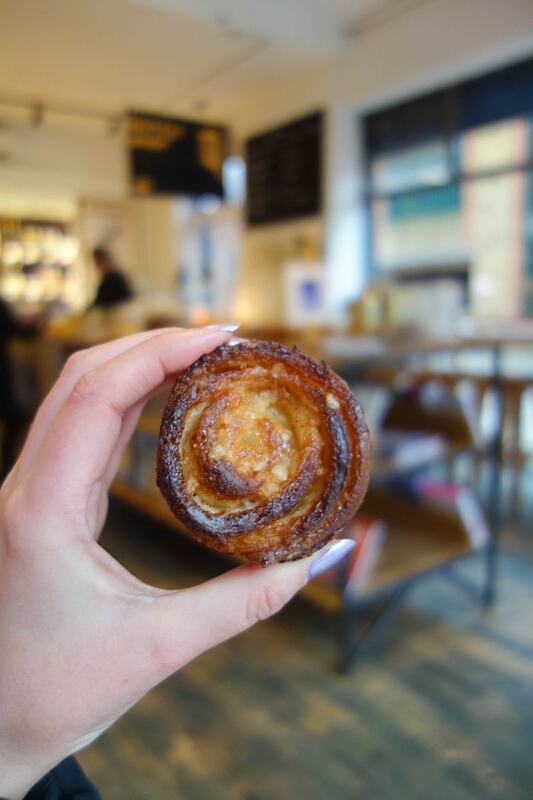 Who knew you could get a Michelin starred cinnamon bun! Aquavit is a 1 star Michelin restaurant in central London doing all day Nordic inspired dining. 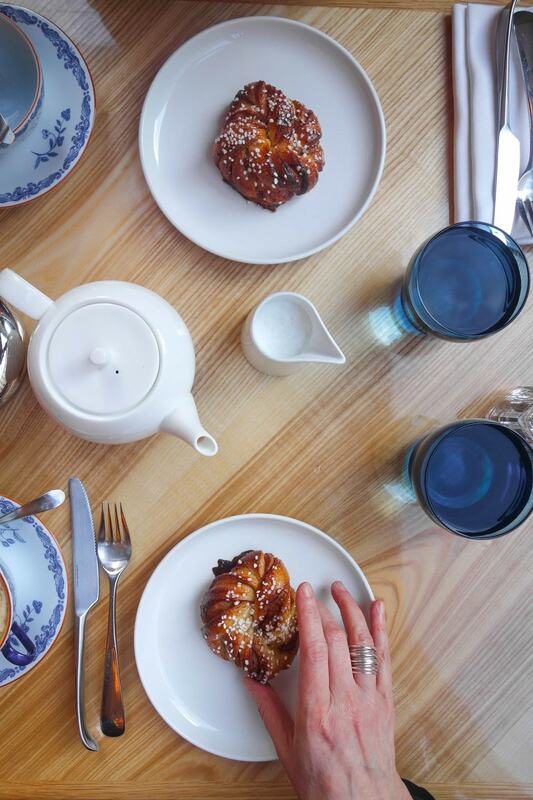 The restaurant is headed up by Swedish chef Henrik Ritzen who together with this team make these light and delicate cinnamon buns in-house. The best part though? This Michelin bun is just £2! 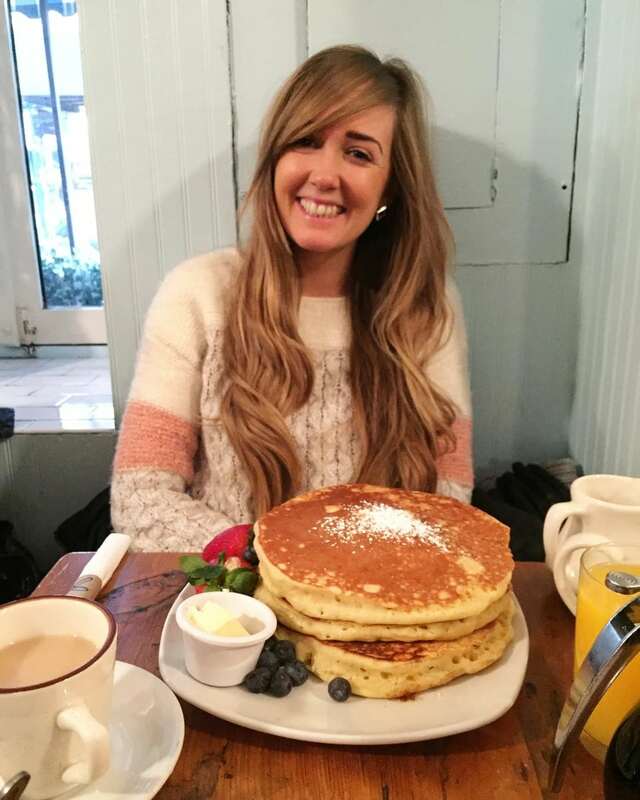 … Not many people can say they’ve eaten somewhere like this for under a fiver! Texture: Light and Soft. Slightly chewy. 10. Pavillion Bakery, Broadway Market. … For the weekend wanderers. 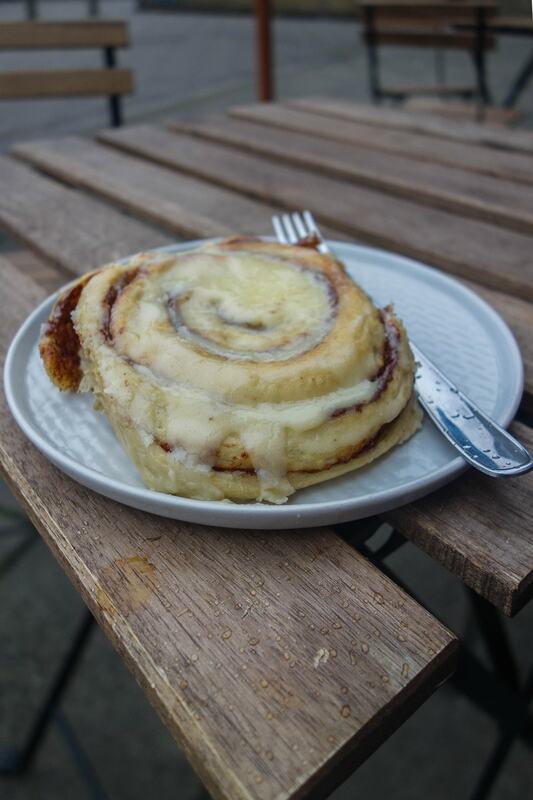 Pavilion bakery is the shop you’ll see at Broadway market with a queue out of the door. 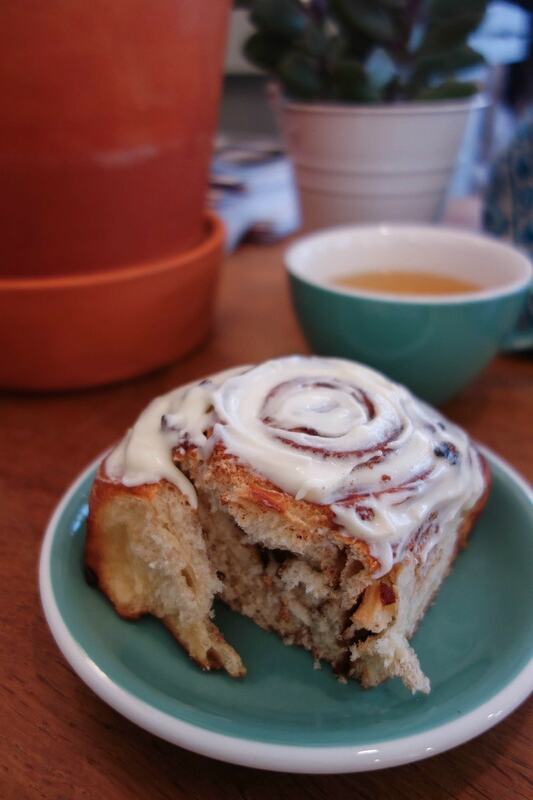 They make freshly baked bread, jams and pastries including their glossy cinnamon rolls. A bun for on the move. 11. Quality Chop House, Farringdon. … For those who want something different. As you can see from the picture below this is not your average cinnamon bun. Some may argue it’s not a cinnamon bun at all! 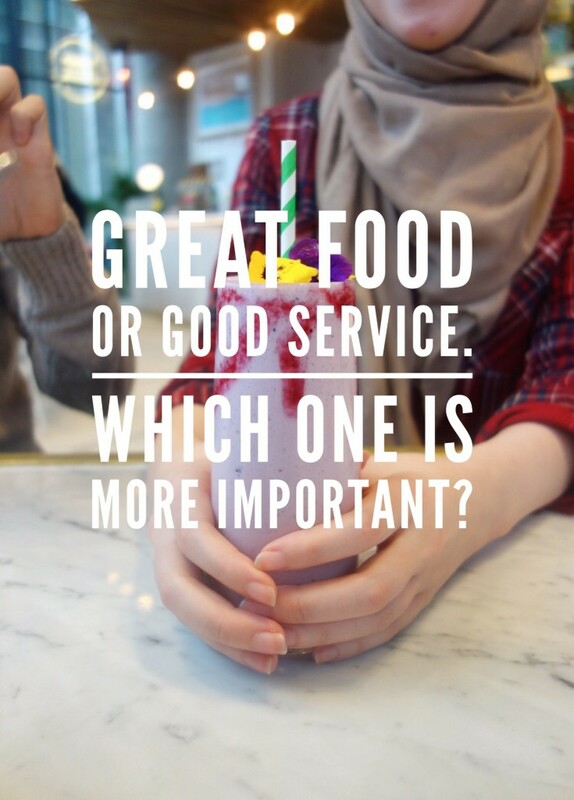 You’ll find it at the Quality Chop Shop deli which is the store attached to the modern British restaurant of the same name. This bite-size delight is more crunchy and caramelised than what you usually get but has swirls of cinnamon layers like a traditional bun. An interesting one. … For those who want to support local business. 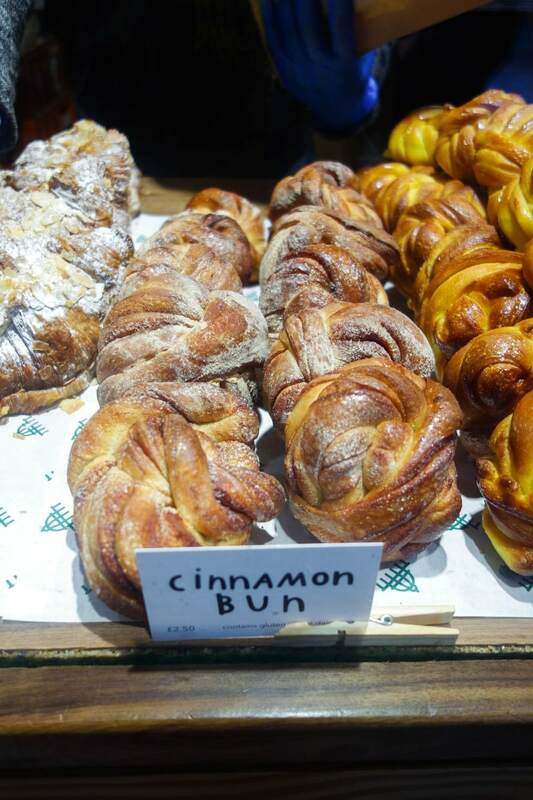 If you want a cinnamon bun produced with nothing but love then you NEED to go to neighbourhood bakery Karma Bread in leafy West Hampstead. Run by Tami and her team, they make all their products in-house, and she tells me the mark of a good bun is to turn it upside down and look for the endless swirls. A good piece of advice from the baking expert and a very good bun. 13. Burnt Toast Cafe, Brixton. As well as their epic breakfast that I bang on about all the time, Burnt Toast do freshly baked goodies including these cinnamon rolls. Made by the cafes self-taught baker Carol, they are soft, chewy and sticky but be warned they don’t do them all the time so go for breakfast one day and hope they have these for bressert. If they don’t you’ll be glad you went anyway.y. 14. Luminary Bakery, Stoke Newington. … For those who want to support good causes. 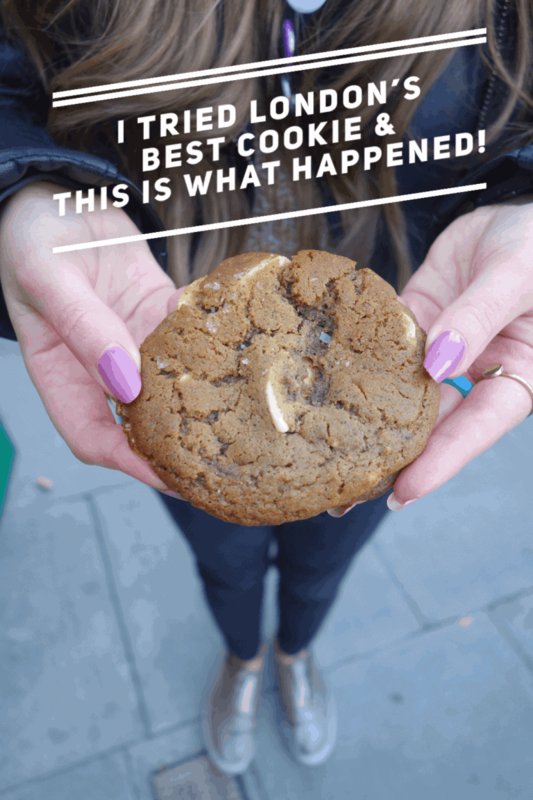 The Luminary Bakery is a social enterprise helping socially and economically disadvantaged women gain transferable skills through the art of baking. 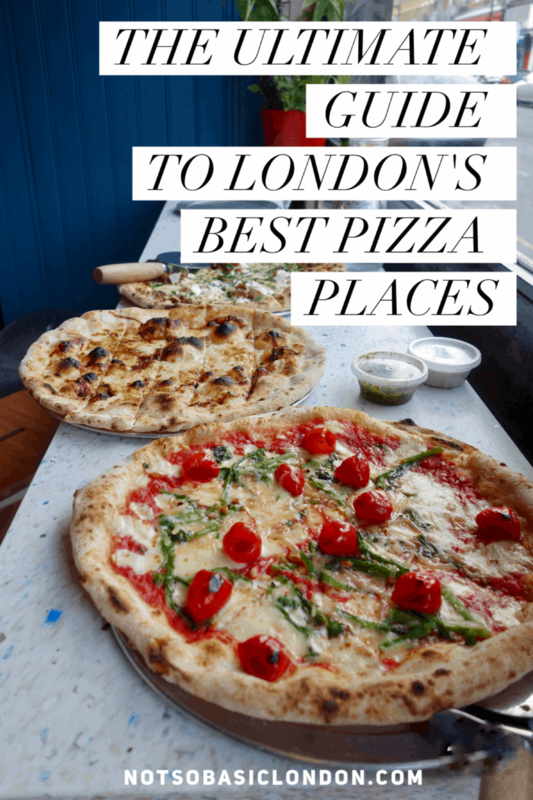 It’s on a quiet residential road in East London and everything is made in-house by the women who have gone through work experience and are now working at the bakery. They are very proud of their cinnamon rolls and founder Alice says it’s her favourite thing at the café. When they ask do you want icing obviously say yes! That cream cheese is the dream. At Luminary, you’re not just buying a cinnamon bun you’re doing some good for the community as well. …For the Oxford Street shoppers. 16. Gails Bakery, Various Locations. 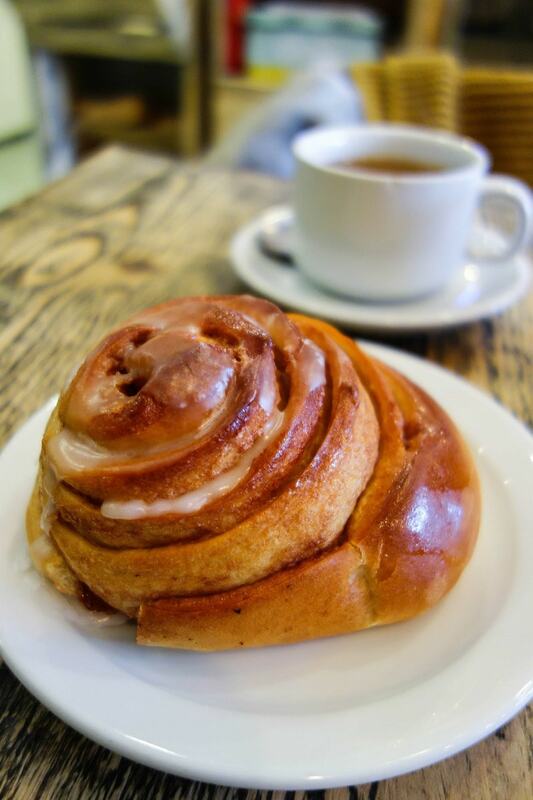 Gails is a chain of artisan bakeries around London so next time you stroll across one pop in for a sugary cinnamon bun and a cuppa tea. They are all piled up high in a rustic kind of way and all come in mismatched shapes and sizes. Then are rolled in a mix of cinnamon and sugar so get the wet wipes at the ready. Swedish bakery Soderberg made a name for themselves in their hometown of Edinburgh, Scotland and have now migrated South to London’s Soho. 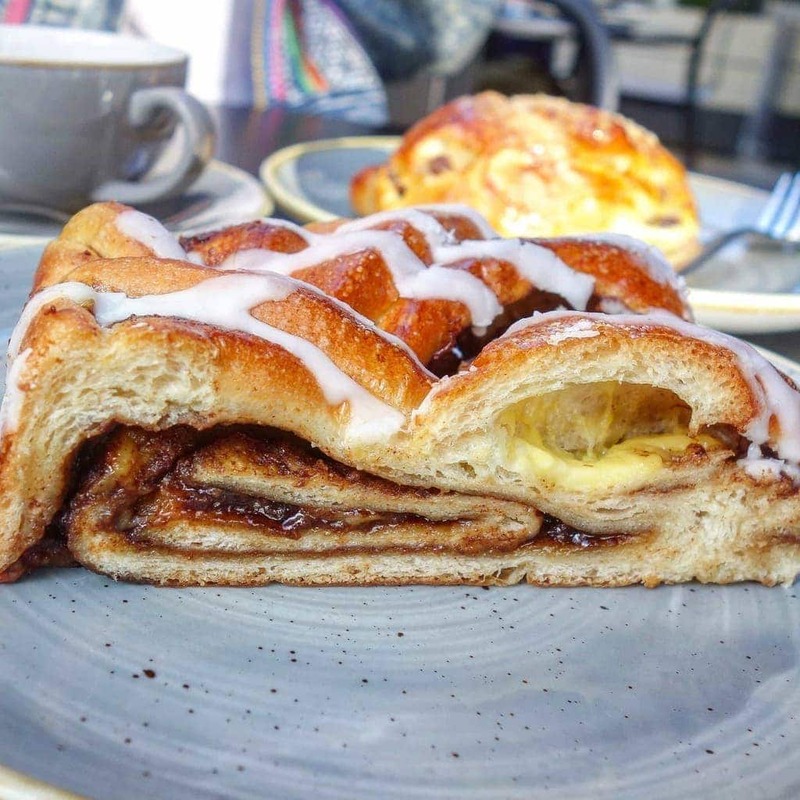 They offer authentically Swedish food including open sandwiches, breads, cakes and of course no Scandi cafe would be complete without a cinnamon bun; there’s of which is filled with custard and fruit. If you can catch them when they’re still warm and squidgy out of the oven I highly recommend it. 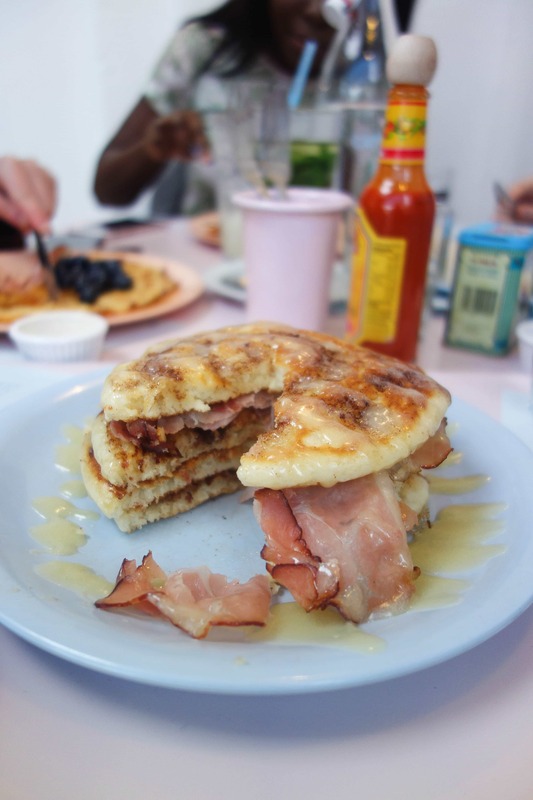 … and just for a laugh – the cinnamon roll pancakes at Cafe Miami. Don’t forget Tromso E7, theirs are amazing!